On August 11, 1966, the first Chevrolet Camaro came off the production line in Norwood, Ohio. Before the magnificently furnished presentation of the novelty, there was still more than a month left. 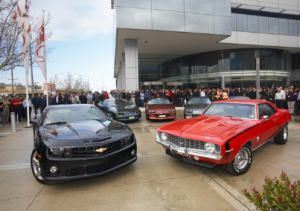 But everyone who participated in creating the model knew – the Ford Mustang had a strong competitor! – What can I say, a great car! Debuting in the spring of 1964 Ford Mustang marked the beginning of a new subspecies of American cars known as pony cars. Small in size, but elegant in appearance, they differed in sporting image and driving characteristics. Mustang, which became a bestseller of universal scale, is rightfully the most vivid embodiment of this segment. However, considering him the progenitor of the class is mistaken. In the end, two weeks before the noisy debut of Ford, the fastback sales of Plymouth Barracuda, which was completely suited to the “pony car” format, started. 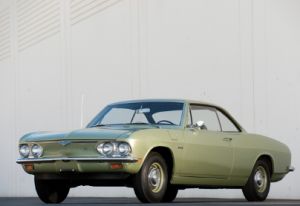 But the main thing is that both Barracuda and Mustang itself became the answer of Chrysler and Ford to the almost forgotten today Chevrolet Corvair Monza of General Motors Corporation. This spectacular externally and technically non-trivial two-seater sports model in the early 60’s became a real surprise for America’s automotive industry.